This shop has been compensated by Collective Bias, Inc. and its advertiser. As always, all opinions and enthusiasm are 100% ours. As a former teacher myself, I know the benefits of setting up healthy habits to prevent illnesses from the first day in my classroom and now at home. It was inevitable that several children (and teachers!) would get sick after the first few weeks of school from being exposed to new people and more germs. 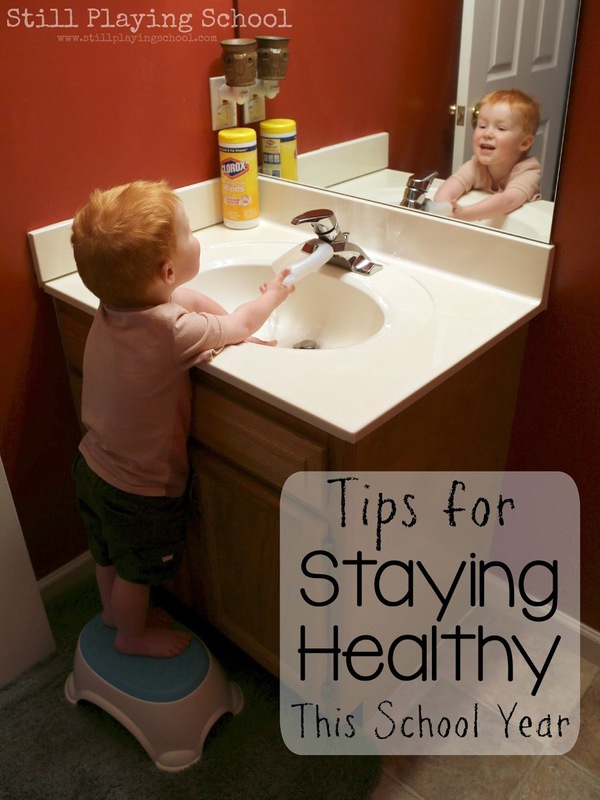 We're sharing our very best tips to make sure you and your children stay healthy this school year! 1. Wash hands before and after school! It seems like a no brainer, right? 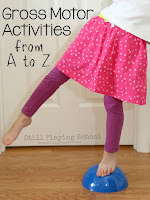 There are still a few things you can do at home and at school to make hand washing an independent and fine motor exercise for your kids as they kill germs! 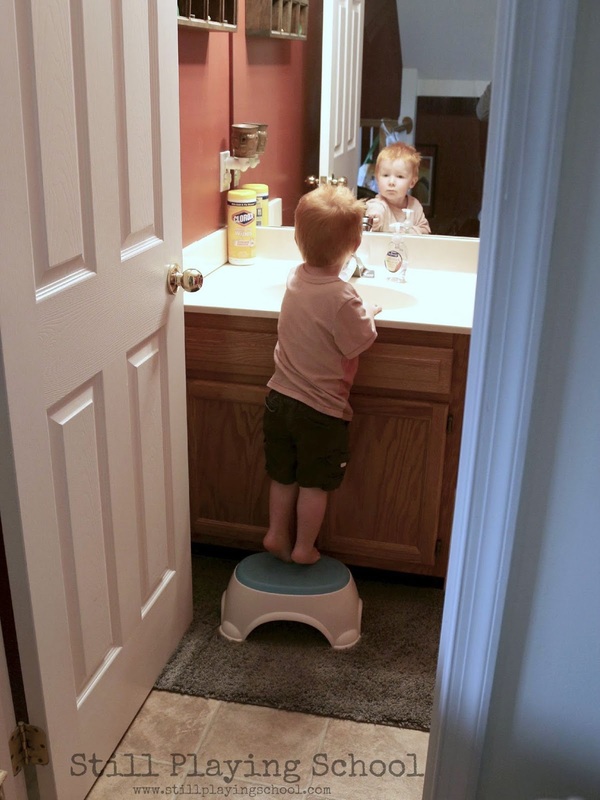 Our bathroom includes a stool to even our toddler can reach the sink. I cut an old shampoo bottle to extend the water from the faucet to reach his hands (which you can see a bit better in that first photo above)! We always let the kids pick out fun soap. Sometimes Santa or the Easter Bunny even brings a new scent or color of soap to make hand washing motivating for everyone! And, since we're teaching independence, I expect a bit of a bathroom mess after the kids are done washing up so I keep Clorox Disinfecting Wipes on hand to wipe clean and disinfect surfaces like the bathroom mirrors and metal fixtures. They have a unique, clear-drying formula that makes any room of the house shine! If your child's school doesn't have a hand washing routine upon arrival, ask the teacher or principal about implementing one. It can be relatively simple with signs to remind students to wash when they enter the school as part of their morning routine. It doesn't take much more time and everyone will be absent less and healthy more! I stay home now to homeschool my Kindergartener but her brother is going to a traditional preschool. This mix of homeschooling and public school will mean that we'll need the germ killing power of Clorox Disinfecting Wipes to keep us all germ free! You probably have a drop zone for shoes, jackets backpacks, and homework when your kids come home from school. If it's a particularly bad flu season or the stomach bug is going around, I also have our kids change their clothes when they get home. Showers or baths can be immediately after school is you want to use them to as a way to regroup a long day and wash away germs! 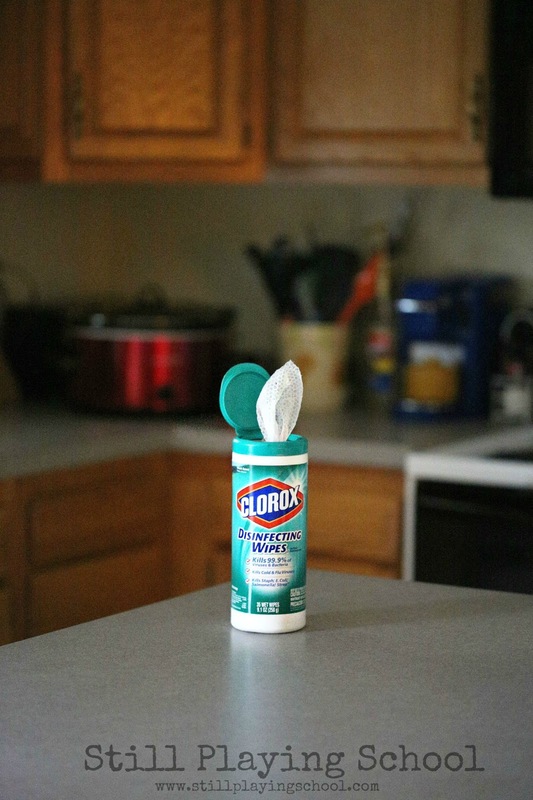 I always make sure to wipe surfaces that the kids touch after school with Clorox Disinfecting Wipes. Light switches, door knobs, the inside of my car, and even backpacks and shoes! Be sure to use as directed and spot check on fabrics, but Clorox Disinfecting Wipes are a multi-surface, multi-mess, all-in-one wipe! 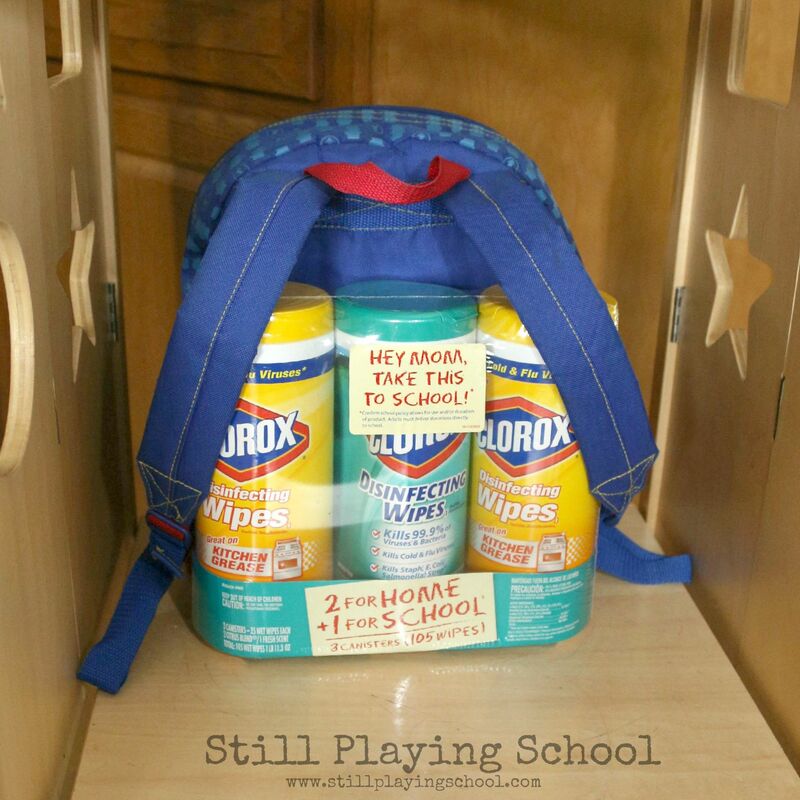 When I was a teacher in the classroom Clorox Disinfecting Wipes were always at the very top of my donations list! The school provides paper towels, of course, but I knew that would just spread germs around and increase the contaminated area! I taught kindergartners who shared tables so I needed Clorox Disinfecting Wipes to kill 99.9% of germs including viruses that cause colds and flu and bacteria such as Staphylococcus aureus, Salmonella enterica, and E. coli. 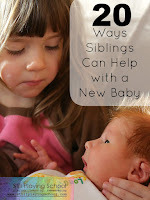 A fabulous way to foster a positive home/school connection is to purchase donations for your child's classroom. Even for birthdays and holidays, classroom donations are welcomed and needed in lieu of gifts! 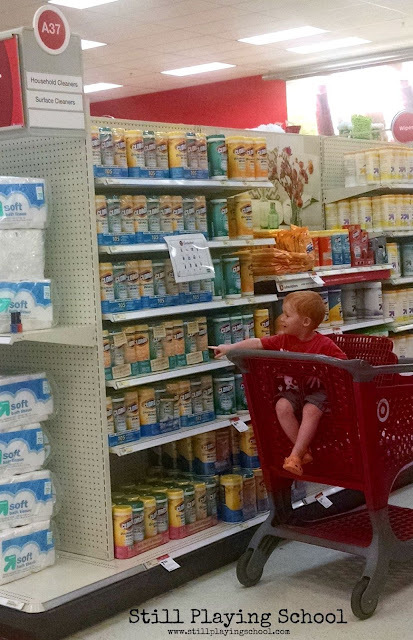 D helped me find the Clorox Disinfecting Wipes at Target as a gift for his new teachers at preschool! 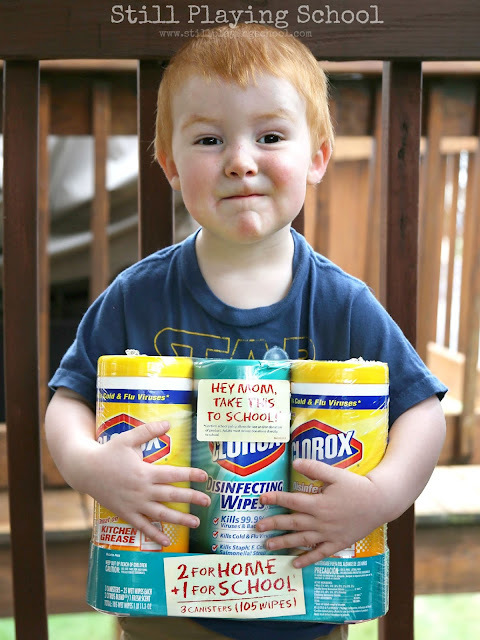 He is so excited to take them with him on his first day to help keep his classroom germ free just like our home. So as you send your little one in to the classroom, send him off with Clorox Disinfecting Wipes! We'd love to hear from you! What do you to to keep yourself and your kids healthy as you are exposed to all kinds of germs during the school year? My son automatically knows after any outing including school to take off his clothes and wash his hands! I also try to keep his book bag wiped down. Along with his lunch box. In my prek classroom, the kiddos wash their hands as they're coming into the classroom for the same reasons! I've considered changing clothes when we come home from work/school too. Great ideas - thank you!